Snow removal is even easier with this revolutionary new steering feature from Ariens. The Auto-Turn offers maximum control, precise turning and smooth operation. There is no more straining your back or fumbling with triggers to turn your Sno-Thro around. Auto-Turn is just that – Automatic. The Sno-Thro® will turn when and where you want it to with no loss of traction! Ariens Company just announced for this winter the snow blower industry’s first Auto-Turn™ steering technology. Auto-Turn will be exclusively found on the company’s line of Sno-Thro® snow blowers. Auto-Turn steering makes snow removal faster and easier, for the operator. 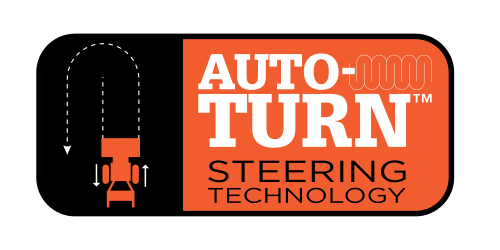 Auto-Turn steering eliminates the need to take large loops during a turn, instead making even, tight turns from the center axis of the machine. You can actually zero-turn. Now operators can avoid straining and pulling when making a turn, instead steering the snow blower precisely and smoothly without adjusting speed. Auto-Turn saves time and increases maneuverability, while decreasing operator fatigue. No levers or triggers to pull. No cables to adjust or replace. No learning curve to use it. The Auto-Turn feature is available on Ariens Deluxe 28 and 30 wheel-drive models and all models in the Ariens Platinum, Professional and Hydro-Pro families. It’s also available on Ariens Pro and Hydro-Pro track-drive models. For more information visit www.ariens.com.